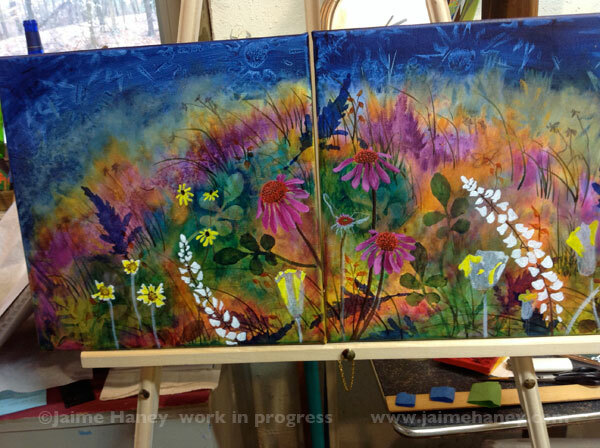 The painting I’m currently working on is a double canvas with vibrant colors of wildflowers, grasses and all kinds of leaves and plants blowing gently on a hillside. 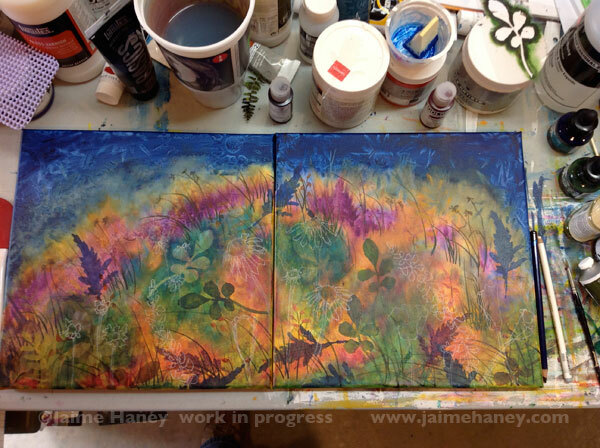 It’s another made up abstract landscape from my imagination that is evolving with each stroke. I am having a great time painting this one. I’ve been listening to Pandora and dancing to latin music as I paint. Certain paintings just call for certain music, you know? I’ve been taking lots of work in progress pictures and here’s what I’ve got so far. I started off with just one canvas actually and then I decided that a double canvas painting would look even better. So I added the canvas on the right. Won’t that look great hanging on the wall maybe over a sofa or or table or even a headboard? 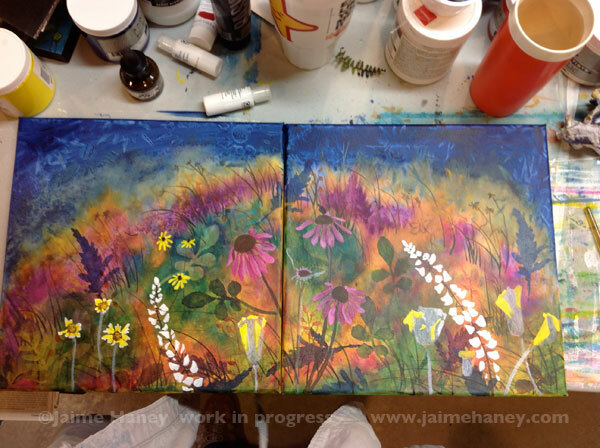 Each canvas is 12″x12″ so it’s going to take up a little more than a two foot rectangle. Next, I added the grasses flowing in the wind and I knew I wanted a bunch of leaves and natural looking silhouettes on the hill. When I first added the gold, pink and blue I didn’t know what it was going to be, at that point it was just abstract shapes of color but then just like all my paintings I make up in my mind, the painting starts to whisper to me. Ha ha, I know that sounds nuts but that is the only way I can explain it. I also get a weird little tingly feeling when I know I’m onto something good and I was feeling that sensation as this painting progressed. I also made handmade stencils from my drawings for the leaves. 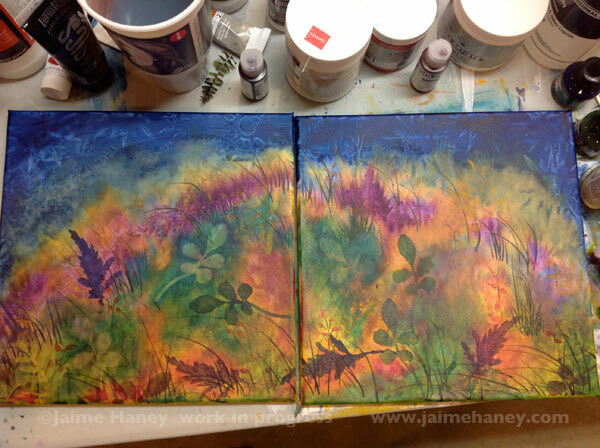 I used both the positive and the negative of the stencils to add interest and depth. Then I knew I wanted to add flowers to be the stars of the show and have more detail. I sketched them in with a white pastel pencil first but I knew that in order to get brighter colors I needed to under paint them first with white. 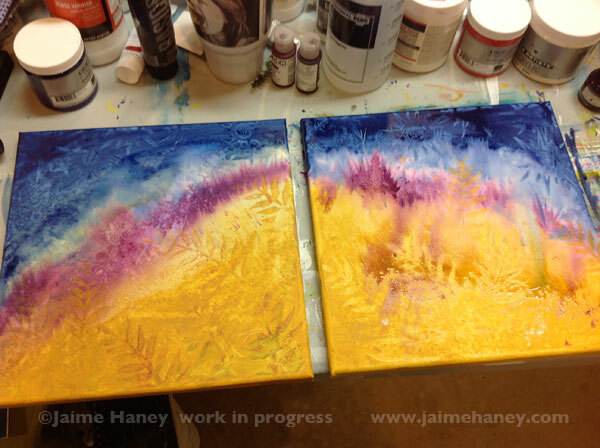 The next two shots are of the white underpainting. 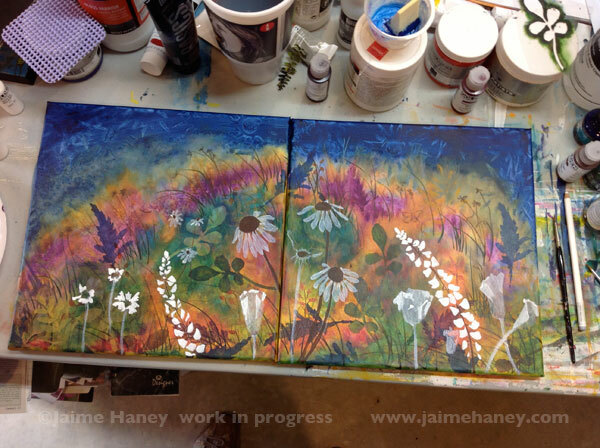 After the underpainting it was time to add some more glorious colors. Although I did for a minute think I might leave them all white, it looked kinda cool like that. 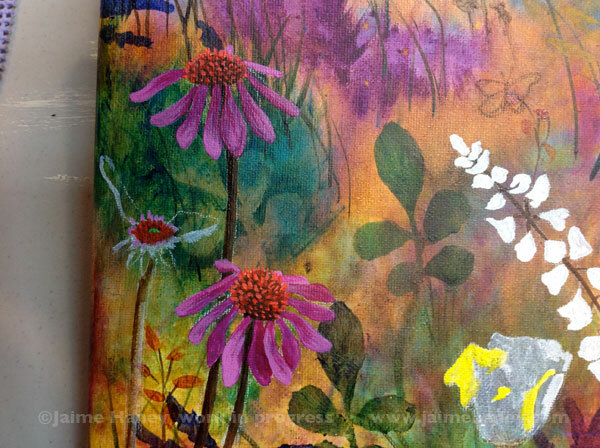 Ultimately, I had to do what the painting told me and that was to add color and more details to the flowers. 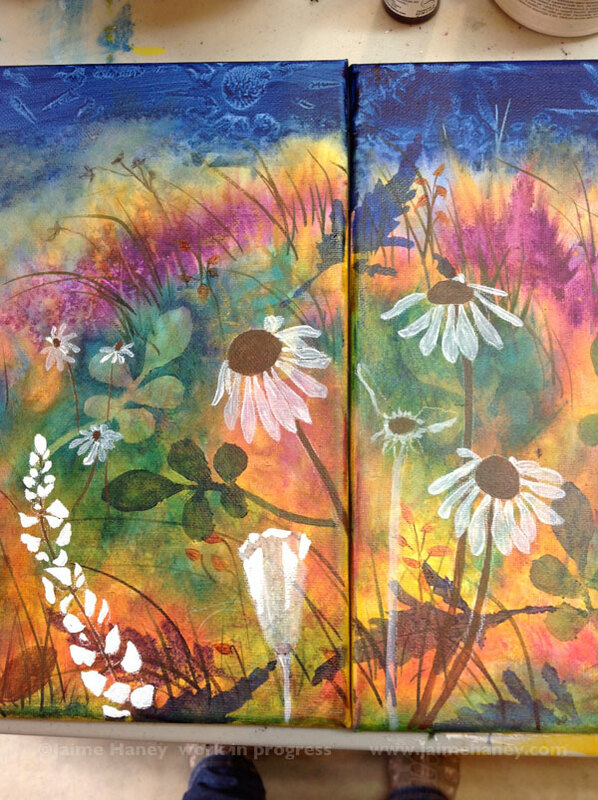 I started with the little yellow flowers on the left and then the black eyed susans and finally added touches of yellow glow to be something like an orange California poppy. I keep getting a glare on the pictures, the right side is worse. Below is the right side canvas to show the colors and detail a little better. Still the glare thing bugs me. 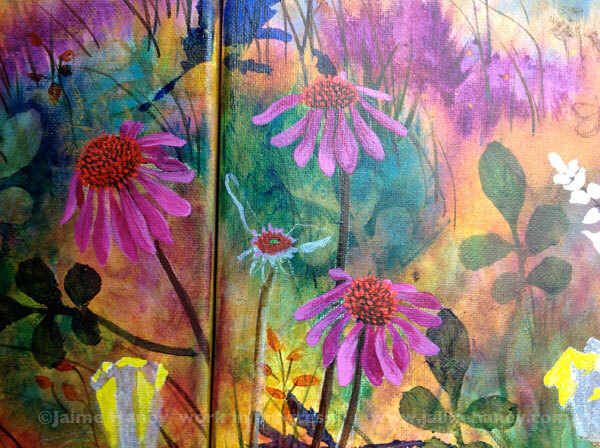 Speaking of bugs, I’ve got a little butterfly sketched in there, see him? I’ll add some sort of life to the left side, maybe a bird or maybe another butterfly or two. I won’t know until I start doing it. And so here it is on an easel. Fixed that glare problem. This is also where I stopped and life’s obligations and mother nature kicked in. These pictures show the progression over several days. Thursday and Thursday night we had crazy spring storms and record rainfall. Lost power during the night for 5 hours so the sump pump wasn’t pumping the water out. Our basement flooded and that is where my studio is. Luckily, my studio doesn’t get as much water in it as the other side of the basement and I’m always ready for it by not having stuff that will get hurt on the floor. But the clean up is a pain in the you know what. It’s just a drainage issue and the water seeps in through the blocks even though I’ve painted multiple coats of water sealer on them. Water always finds a way. I’m eager to get back on this painting and finish it. In the meanwhile, I’m slowly adding my paintings and prints into my new e-commerce website here. 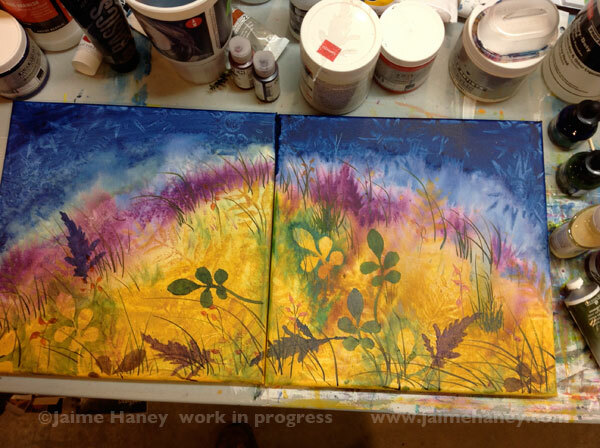 Big learning curve and all this techy stuff is taking me away from painting. But it’s gotta be done. Thanks for following along with Abundant Blessings! I’ll be posting more pictures of hopefully a finished set here in a couple days. 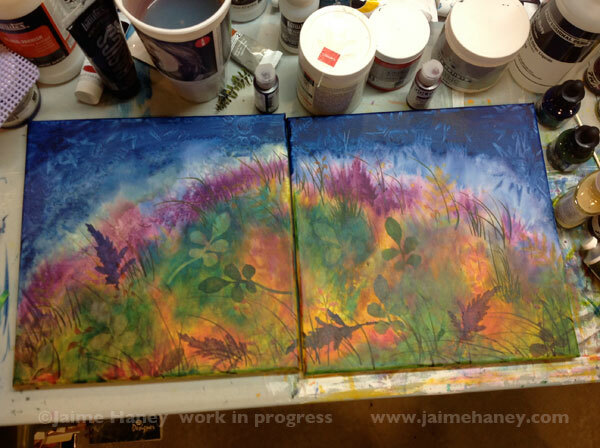 UPDATE: These two paintings have sold, but beautiful prints are available for purchase here. It’s beautiful jaime 🙂 I spotted the butterfly, I bet those grasses are teeming with beautiful gorgeous insects of all kinds. I loved seeing the progression of this art! Thanks for sharing! I love sharing and looking back at my progress myself Terri. I’m so glad you stopped by. Thank you!